This post is by Matthew Lockwood, a senior research fellow in the Energy Policy Group at the University of Exeter. Angela Merkel’s visit to London yesterday is being widely reported in the context of David Cameron’s efforts to secure EU reform. However, the presence of Europe’s electorally most successful leader is also a reminder of some contrasts between Germany and the UK in the area of energy policy. In other words, the nature of policy can have political effects that, in turn, support or undermine the future of that policy, what political theorists call ‘policy feedback’. Renewable energy support policies inevitably produce negative feedback effects. This includes financial costs, but can also involve local concern about wind turbines in the landscape. These are found in both countries. But in Germany, these are balanced by strong positive feedback effects, by widely dispersed investment, by the fact that wind farms were owned by locals, not fat cat outsiders, and by the jobs in the supply chains. So does this mean that UK policy makers should copy the Germans? One understandable concern is that if policy makers start doling out subsidy in such a way as to ensure political support, they risk being captured by particular groups and the public purse gets milked. This is similar to an oft-expressed concern about industrial policy. Of course, this is a risk but it can be managed. The greater risk is of not creating positive feedback so that policy is much more politically unstable. There are also good principles for minimising the danger of rent seeking or corporate capture. For example, in Germany, rates of support have come down as technologies get cheaper and economies of scale are realised, a process called ‘degression’. Technology costs are regularly assessed by independent research institutions and rate adjustments overseen by Parliament, all of which helps build accountability and trust. A final issue is the argument that this works all very well in Germany but it would never work here. There is something in this. Germany has institutions that have proven important for the effectiveness of the policy, and have also amplified its political effects. The state-owned development bank (KfW) has helped provide finance for local small-scale renewable ownership. There is no equivalent institution in the UK. Despite reforms over the last two decades, Germany still has a stronger welfare system, and poverty is not so entrenched, meaning that the implications of the costs of renewables for energy bills for fuel poverty is less of an issue in the UK. Not all of these institutions can easily be replicated in Britain. But we might have a go at building some of them (for example, using the Green Investment Bank to help support community scale energy as well as big offshore wind projects). And they are not subsidies, unless you think public healthcare in the UK is also a subsidy. Thank you for illustrating so succinctly how Germany is setting the UK an example in how to manage renewable energy effectively through community funded on shore wind and solar power. In the UK we need to increase taxpayer funding in developing commercial PV on supermarket and industrial estate roofs. These will then provide electricity to adjacent domestic users through small grids. 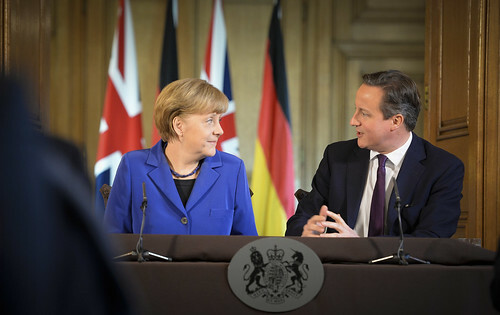 We hope there was some discussion of how to proceed with European smart grid sharing between the David Cameron and Angela Merckel at their recent lunch meeting in Downing Street.